THE first Papal visit for almost 30 years was looking increasingly likely last night after Pope Benedict XVI said he hopes to visit Ireland. The Pontiff conveyed his wishes personally to Ireland's new Cardinal, Sean Brady, at a private audience in the auditorium of the Paul VI hall in the Vatican, where the two men embraced warmly. Cardinal Brady took the opportunity to renew the invite which he first made in October last year on behalf of the Irish Hierarchy. Pope Benedict's immediate confirmation that he would like to come to Ireland despite his limited foreign travel schedule was a clear signal that a visit is being seriously considered by the 80-year-old Pope. Speaking to the Irish Independent immediately after his audience, Cardinal Brady said: "I took the opportunity of our brief meeting to renew the invitation on behalf of the Irish Episcopal Conference." 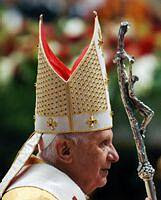 Asked what Pope Benedict's response was, Cardinal Brady revealed that the Holy Father said: "I hope so". This clearest indication to-date of the Pope's desire to undertake an Irish visit, the highlight of which would be a fulfilment of the late John Paul II's plans to pray in the Armagh Cathedral of St Patrick, Ireland's patron saint, will renew intensive diplomatic lobbying by the governments in Dublin, London and Belfast to bring this about. The high-profile attendance by representatives from the three administrations at the weekend ceremonies in Rome, at which the former Archbishop Brady (68) was installed as a member of the College of Cardinals, has been well received by both the Pope and senior Vatican officials. President Mary McAleese, the Minister for Foreign Affairs Dermot Ahern, the British Minister overseeing the North, Shaun Woodward, and the Stormont Executive's Deputy First Minister, Martin McGuinness, attended the ceremony. All spoke glowingly of the era of potential prosperity and permanent peace that has opened up as a result of the formation of the power-sharing executive at Stormont. In turn, Pope Benedict has cited, on several occasions in recent months, his belief that the peace settlement in the North provides a model for the resolution of other conflict situations in the world, especially the Middle East. Cardinal Brady told the Irish Independent that he sensed that the presence at his installation of President McAleese and the top level representatives from the three governments was "a consummation" of the appeal by Pope John Paul II in Drogheda during his historic visit to Ireland in 1979 when he prayed for an end to violence. "It was the answer to John Paul's prayer," he added. But the Cardinal also noted that there was a sense of "unfinished business" because Pope John Paul's intention to visit Armagh had been frustrated by the violence of the IRA. Last night, Vatican sources indicated that, while consideration was being given to Pope Benedict's visiting Ireland, no commitment had yet been made, and the first definite sign of a planned visit would require its inclusion in his draft travel schedule. The Vatican officials confirmed that the programme for Pope Benedict's visit to America next spring were almost completed, but that this has not dampened speculation that he could make a brief stop-over in Ireland en route to the United States. Last night at the final public event in his three-day Rome engagements, Cardinal Brady presided at his first Mass as a Prince of the Church in the Basilica of St John Lateran.